When you install a new computer or update an existing computer, you'll often need to partition the drives on the computer. You partition drives using Disk Management. In Windows Server 2008, a physical drive using MBR partition style can have up to four primary partitions and one extended partition. This allows you to configure MBR drives in one of two ways: using one to four primary partitions, or using one to three primary partitions and one extended partition. A primary partition can fill an entire disk, or you can size it as appropriate for the workstation or server you're configuring. Within an extended partition, you can create one or more logical drives. A logical drive is simply a section of a partition with its own file system. Generally, you use logical drives to divide a large drive into manageable sections. With this in mind, you might want to divide a 600 GB extended partition into three logical drives of 200 GB each. Physical disks with the GPT partition style can have up to 128 partitions. After you partition a drive, you format the partitions to assign drive letters. This is a high-level formatting that creates the file system structure rather than a low-level formatting that sets up the drive for initial use. You're probably very familiar with the C drive used by Windows Server 2008. Well, the C drive is simply the designator for a disk partition. If you partition a disk into multiple sections, each section can have its own drive letter. You use the drive letters to access file systems in various partitions on a physical drive. Unlike MS-DOS, which assigns drive letters automatically starting with the letter C, Windows Server 2008 lets you specify drive letters. Generally, the drive letters C through Z are available for your use. Note The drive letter A is usually assigned to the system's floppy disk drive. If the system has a second floppy disk drive, the letter B is assigned to it, so you can use only the letters C through Z. Don't forget that CD-ROMs, Zip drives, and other types of media drives need drive letters as well. The total number of drive letters you can use at one time is 24. If you need additional volumes, you can create them using drive paths. Using drive letters, you can have only 24 active volumes. To get around this limitation, you can mount disks to drive paths. A drive path is set as a folder location on another drive. For example, you could mount additional drives as E:\Data1, E:\Data2, and E:\Data3. You can use drive paths with basic and dynamic disks. The only restriction for drive paths is that you mount them on empty folders that are on NTFS drives. To help you differentiate between primary partitions and extended partitions with logical drives, Disk Management color-codes the partitions. For example, primary partitions might be color-coded with a dark-blue band and logical drives in extended partitions might be color-coded with a light-blue band. The key for the color scheme is shown at the bottom of the Disk Management window. You can change the colors in the View Settings dialog box by choosing Settings on the Disk Management View menu. Windows Server 2008 simplifies the Disk Management user interface by using one set of dialog boxes and wizards for both partitions and volumes. The first three volumes on a basic drive are created automatically as primary partitions. If you try to create a fourth volume on a basic drive, the remaining free space on the drive is converted automatically to an extended partition with a logical drive of the size you designate by using the new volume feature it created in the extended partition. Any subsequent volumes are created in the extended partitions and logical drives automatically. In Disk Management's Graphical View, right-click an unallocated or free area and then choose New Simple Volume. This starts the New Simple Volume Wizard. Read the Welcome page and then click Next. 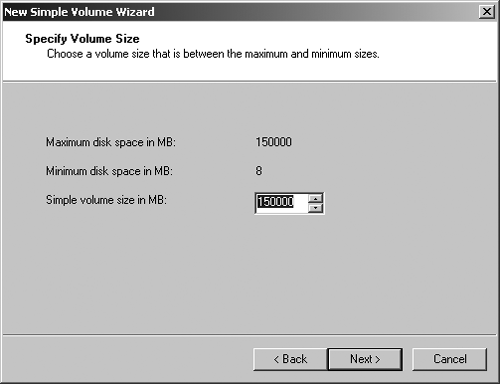 The Specify Volume Size page, shown in Figure 12-3, specifies the minimum and maximum size for the volume in megabytes (MB) and lets you size the volume within these limits. Size the partition in MB in the Simple Volume Size field and then click Next. Figure 12-3 Set the size of the volume on the Specify Volume Size page. Assign The Following Drive Letter Choose this option to assign a drive letter. 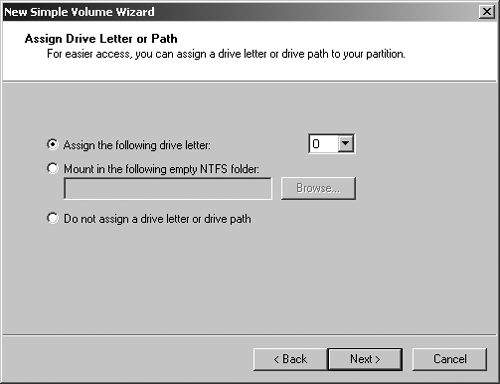 Then select an available drive letter in the selection list provided. By default, Windows Server 2008 selects the lowest available drive letter and excludes reserved drive letters as well as those assigned to local disks or network drives. Mount In The Following Empty NTFS Folder Choose this option to mount the partition in an empty NTFS folder. You must then type the path to an existing folder or click Browse to search for or create a folder to use. Do Not Assign A Drive Letter Or Drive Path Choose this option if you want to create the partition without assigning a drive letter or path. If you later want the partition to be available for storage, you can assign a drive letter or path at that time. Note You don't have to assign volumes a drive letter or a path. A volume with no designators is considered to be unmounted and is for the most part unusable. An unmounted volume can be mounted by assigning a drive letter or a path at a later date. See "Assigning Drive Letters and Paths" on page 357. Figure 12-4 On the Assign Drive Letter Or Path page, assign the drive designator or choose to wait until later. File System Sets the file system type as FAT, FAT32, or NTFS. 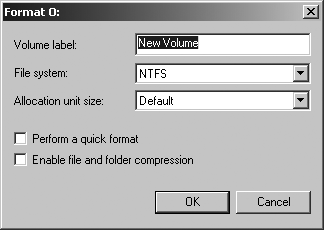 NTFS is selected by default in most cases. If you create a file system as FAT or FAT32, you can later convert it to NTFS with the Convert utility. You can't, however, convert NTFS partitions to FAT or FAT32. Allocation Unit Size Sets the cluster size for the file system. This is the basic unit in which disk space is allocated. The default allocation unit size is based on the size of the volume and, by default, is set dynamically prior to formatting. To override this feature, you can set the allocation unit size to a specific value. If you use many small files, you might want to use a smaller cluster size, such as 512 or 1024 bytes. With these settings, small files use less disk space. Volume Label Sets a text label for the partition. This label is the partition's volume name and by default is set to New Volume. You can change the volume label at any time by right-clicking the volume in Windows Explorer, choosing Properties, and typing a new value in the Label field provided on the General tab. Perform A Quick Format Tells Windows Server 2008 to format without checking the partition for errors. With large partitions, this option can save you a few minutes. However, it's usually better to check for errors, which enables Disk Management to mark bad sectors on the disk and lock them out. Enable File And Folder Compression Turns on compression for the disk. Built-in compression is available only for NTFS. Under NTFS, compression is transparent to users and compressed files can be accessed just like regular files. If you select this option, files and directories on this drive are compressed automatically. For more information on compressing drives, files, and directories, see "Compressing Drives and Data" on page 368. 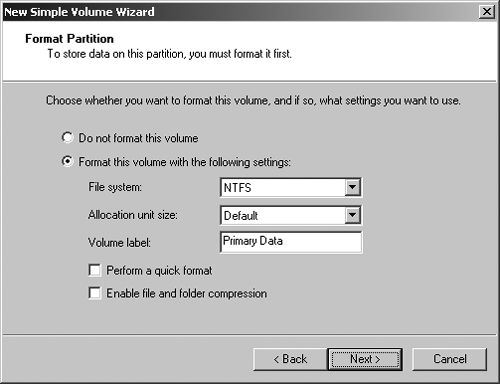 Figure 12-5 Set the formatting options for the partition on the Format Partition page. Click Next, confirm your options, and then click Finish. Formatting creates a file system in a partition and permanently deletes any existing data. This is a high-level formatting that creates the file system structure rather than a low-level formatting that initializes a drive for use. To format a partition, right-click the partition and then choose Format. This opens the Format dialog box shown in Figure 12-6. Figure 12-6 Format a partition in the Format dialog box by specifying its file system type and volume label. Volume Label Specifies a text label for the partition. This label is the partition's volume name. File System Specifies the file system type as FAT, FAT32, or NTFS. FAT is the file system type supported by MS-DOS and Microsoft Windows 3.1, Windows 95, Windows 98, and Windows Me. NTFS is the native file system type for Microsoft Windows NT and later releases of Windows. Allocation Unit Size Specifies the cluster size for the file system. This is the basic unit in which disk space is allocated. The default allocation unit size is based on the size of the volume and is set dynamically prior to formatting. To override this feature, you can set the allocation unit size to a specific value. If you use lots of small files, you might want to use a smaller cluster size, such as 512 or 1024 bytes. With these settings, small files use less disk space. Perform A Quick Format Tells Windows Server 2008 to format without checking the partition for errors. With large partitions this option can save you a few minutes. However, it's more prudent to check for errors, which allows Disk Management to mark bad sectors on the disk and lock them out. Enable File And Folder CompressionTurns on compression for the disk. Built-in compression is available only for NTFS. Under NTFS, compression is transparent to users and compressed files can be accessed just like regular files. If you select this option, files and directories on this drive are compressed automatically. For more information on compressing drives, files, and directories, see "Compressing Drives and Data" on page 368. When you're ready to proceed, click OK. Because formatting a partition destroys any existing data, Disk Management gives you one last chance to abort the procedure. Click OK to start formatting the partition. Disk Management changes the drive's status to reflect the formatting and the percentage of completion. When formatting is complete, the drive status will change to reflect this. © Microsoft. All Rights Reserved.